Our olive green pyramid 4x6 post caps are made of ASA resin, a material that we use for many of our fence post toppers. ASA resin is the material that automobile and marine vehicle makers choose for the products they manufacture because of its strength and durability. A fraction of the cost of comparable wood post caps. 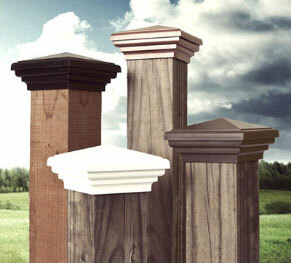 We designed our fence post caps, which are made in the USA, to offer unparalleled UV and impact resistance. That means that they will withstand any harsh weather conditions, including blizzards, hurricanes, or tornadoes. Unlike wood and traditional paint, our post caps don't get cracked, chipped or dented from humidity, severe storms, or any other seasonal weather-related contraction and expansion issues. We’re willing to stand behind that claim and back it up with a 10-year guarantee. Our unique SNAP-CAP Installation technology makes it easy for you to install your 4x6 post caps. You won’t have to worry about water collecting under the post cap, or decay and erosion because of damage from insects and gnawing animals. Our fence post toppers come in a wide range of styles and colors to fit the architectural style of your home and existing fence. We offer the benefit of a maintenance-free product that requires no maintenance and is more durable than any wood or other synthetic fence post caps. Our fence post toppers are stronger and more durable than comparable wood post caps, and they cost a fraction of the price, too. We offer the only patented fence post caps on the market. We stand by our products with a ten-year guarantee against discoloration, fading or warping. We make all of our own post caps and sell them directly to customers or in bulk. We pride ourselves on customer satisfaction, and we stand by our commitment by offering a 100% satisfaction guarantee. So if our post caps don’t meet your needs, we’ll give you a full refund.